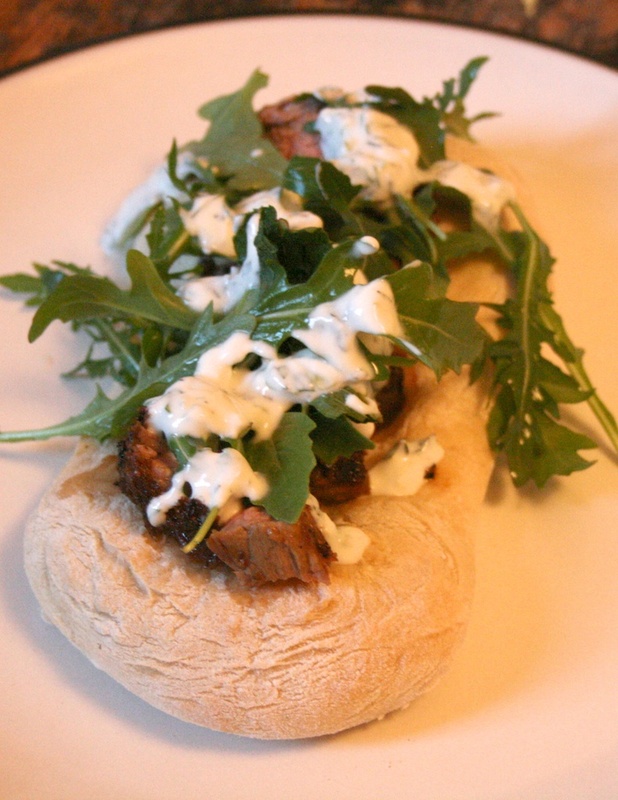 Lamb flatbreads on a Tuesday, Nige? When stuck for meal ideas, one of my favourite ways to find inspiration is to look through Nigel Slater’s Kitchen Diaries. You probably know the book, but if not it does pretty much what it says on the tin: a year in Nigel Slater’s kitchen. The reason I love it is because it’s a month by month and day by day account of seasonal recipes. You can pretty much go to the very day of the month and see what’s good to eat right now. 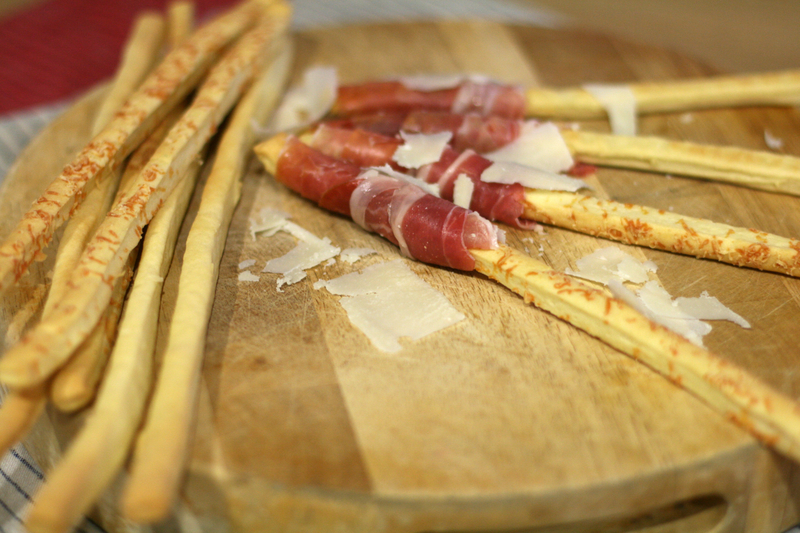 Well, it’s two days until I go to Italy and the salad diaries must come to an end – as we always knew they would. I’ve really enjoyed navigating this world of tomatoes, capers, herbs, leaves, pulses (and meat!) and I really hope you have too. I also hope that I’ve demonstrated that salad doesn’t have to be boring and it is as versatile as any other genre of cooking. The initial point of this series was to get my body bikini-ready. Well, I have to admit that I don’t think I’ve been overly successful in that stated aim, but the salads along the journey have been their own reward. 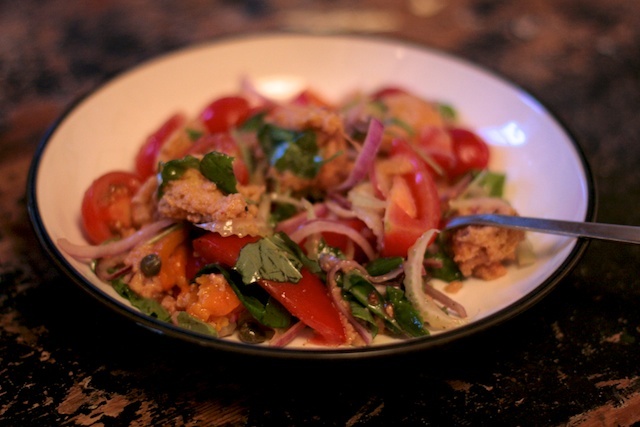 I finish on the Italian classic, Panzanella, in tribute to my very imminent to departure therewith. Ok, I know baking hot cross buns at Easter is pretty obvious, but as this is my first year of blogging I reserve the right to do the obvious thing. Next year it will be incumbant upon me to be a bit more imaginative, but this year I will cook hot cross buns at Easter, mince pies at Christmas and pumpkin pie at Halloween. 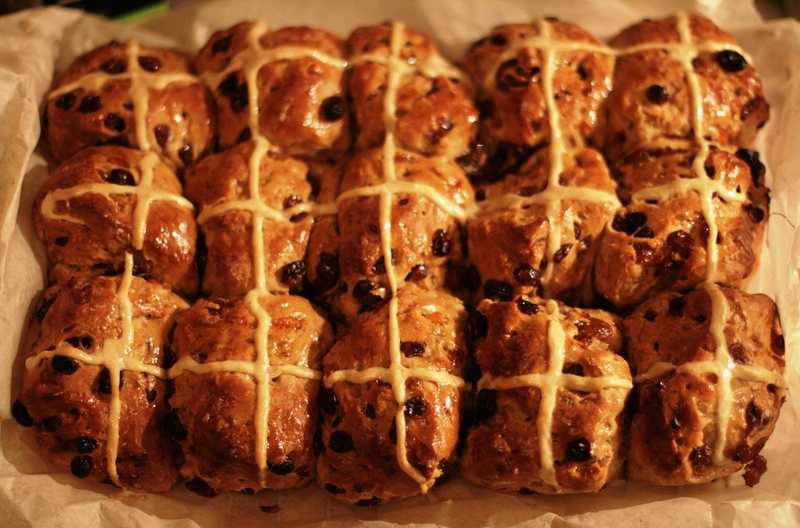 However, I will at least promise to try to do the unobvious with the obvious… so for my Easter cliché I thought I would try a variation on Dan Lepard’s (of The Guardian) stout and tea hot cross buns. 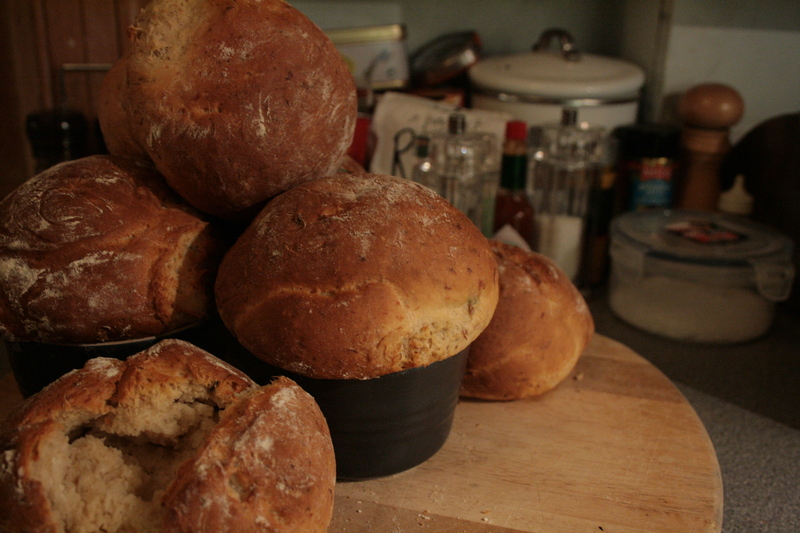 There are few things in life more satisfying than baking your own bread. The process of making the dough is full of violent kneading and pounding, allowing one a thinly veiled cover for expelling the weeks frustrations on a Saturday morning (because when else do you have time to bake bread?). Whilst the bread is baking the oven, the smell eminating is so delicious that the entire neighboured salivates at the prospect and admires your domesticity. Then finally, once the bread is completed you really feel very proud of yourself and utterly convinced of your own self-sufficiency. You are a domestic goddess. You have baked your own bread! What can be more wonderful.